Treat House Vacation Rental in Seattle (Ballard) | Ballard (Seattle) Neighborhood Vacation Rental (206)255-9770 tel. Treat House Vacation Rental is a Vacation Rental in Seattle’s northern neighborhood of Ballard. 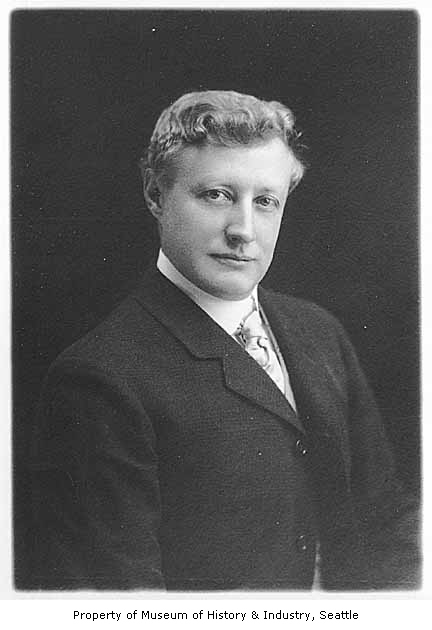 We have two Vacation Rental units in our historic home which was once owned by “Harry Whitney Treat” a land speculator. 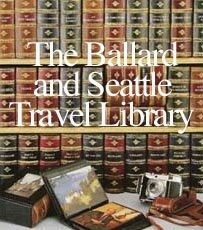 Important travel information about Seattle, “The Emerald City”, and Ballard. Have a great trip and we look forward to talking with you. 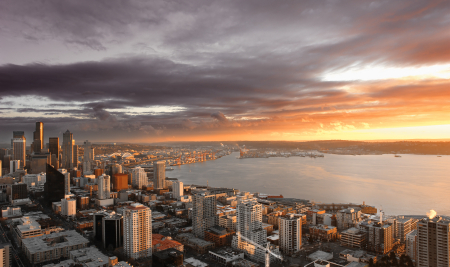 Seattle has a temperate, maritime climate due to its close proximity to the Pacific Ocean. The weather is also strongly influenced by the nearby mountain ranges. Washington State is generally moist and mild on the west side of the Cascade Mountains, where Seattle is located, and dry and less temperate on the east side. 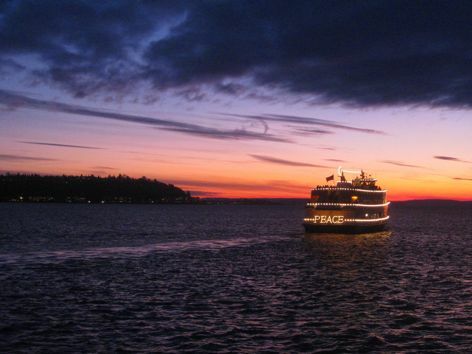 Mild temperatures are prevalent year around in Seattle. Temperatures rarely get very cold in the winter or very hot in the summer. During the fall and winter, powerful storms often blow in off the ocean, bringing strong winds and drenching rains to the Puget Sound region. The mountains, especially the Olympics to the west of Seattle, receive the brunt of these storms; some rain forests on the southwestern side of the Olympics get over 200 inches of rain every year. The rain shadow effect is pronounced on the eastern slopes of the Olympics. Sequim, on the northeastern edge of the range only receives about 16 inches of rain a year. Seattle is known for being a rainy city, and the reputation is well earned. Even though the yearly precipitation totals are not very impressive compared to many other cities, Seattle has a higher number of rainy days every year than any other major city in the continental United States. Annual precipitation is 36.2 inches; in comparison, New York City receives 40.3 inches. Often the rain is barely more than a drizzle, but will last for much of the day. Seattle also endures more overcast days than any other major city in the U.S. The rainy season often begins around mid-October. Any day from Halloween to Easter, it’s a good idea to carry an umbrella. Even with all of the precipitation in the winter months, Seattle gets very little snow. During a typical year, accumulating snow will fall less than three times. The temperature fails to reach freezing about two days a year on average. Every few years, a cold snap will plunge Western Washington below freezing for several days in a row, but such freezes rarely last for more than three of four days. Spring in Seattle tends to be balmy, with considerably less storminess than winter. Rain is still a common occurrence, but the cloudiness is less oppressive as the sun usually returns before too long. Many flowers begin blooming as early as late February or early March. If there is any time to be in Seattle, it is definitely the summertime. The city enjoys one of the most pleasant climates in the U.S. from June through September. Sunshine is the rule, with most days between 70 and 85 degrees. If an onshore sea breeze is blowing, the morning may start off foggy, but the sky usually clears by early afternoon at the latest. On the other hand, if a light offshore wind is blowing from the east, not a cloud may be seen and temperatures may ascend well into the 80s. Occasionally, a strong high pressure system causes temperatures to reach the 90s, but this usually only happens once a summer. Travelers to the north Pacific coast can be forgiven for comparing it to the African Serengeti in the abundance and splendor of its viewable wildlife. Whales—especially orcas—are a very common sight along the north Pacific coast; any traveler who puts forth the effort is almost certain to see a whale. Whale cruises, private boats, and ferries all reliably provide tourists with a chance to see whales. Whale watching season lasts from March through early October, but tourists may see dolphins, sea lions, otters, and other marine mammals any time of the year. Visitors are most likely to see a whale on a whale cruise. Since whales generally frequent certain areas, tour operators need only take visitors to the appropriate spot and wait for the whales to come to the surface for air. Whale tours normally last for three to five hours. 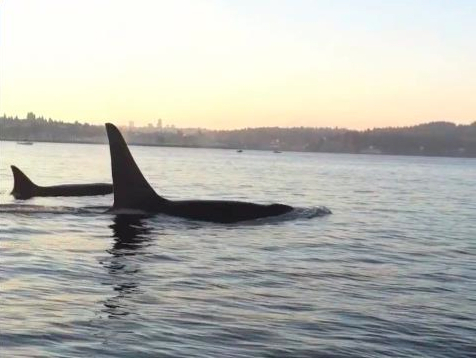 Orcas—sometimes called killer whales—are especially popular with tourists. To live, orcas must follow their prey, and therefore can be found in areas with fish, sea lions, seals, and even other whales, which orcas have been known to hunt. This makes the orca a wonderful whale to try and see, because visitors are often treated to a view of their prey. Orcas are very active swimmers and visitors frequently see them dive and leap from the water. Adorable baby orcas are a common sight. Whale watchers are also very likely to see humpback whales. Humpback whales sometimes hunt alone but can also be seen in spectacular groups of up to fifteen. They swim very actively and often slap the water, breach completely, or blow water high into the air—sometimes dousing tourists. This can be a spectacular, unforgettable sight, as humpback whales can be 16 or more meters in length. Whale watchers can also hope to see grey whales, humpback whales and right whales. Each whale is spectacular in its own right. Grey whales, for example, are covered in barnacles and move along the water slowly and regally, as if they were royalty. Tourists may see several species of whale on a single whale watching cruise. However, whale watchers should not count on seen a Minke whale. The Minke whale is shaped like a torpedo and is a rare but exhilarating sight. At about the same size as a killer whale, the Minke whale is a very fast swimmer at more than 20 mph and can remain underwater for long lengths of time. Whale watchers are likeliest to spot these long, sleek whales animals when they come up to feed on fish. Because they are difficult to spot, Minke whales are little understood, and even those scientists that watch whales professionally have yet to decipher their migratory patterns. If you decide to whale watch along the north Pacific coast, a paid whale tour is the surest way to see a whale. However, whale cruises are not the only way to see whales. British Columbia and Washington State operate an extensive network of ferries that offer visitors the chance watch whales while traveling to destinations such as Vancouver, Victoria, Seattle, and the San Juan Islands. Whale watchers may also rent a kayak or other small vessel and see whales, though it is best to exercise caution in approaching the animals. Finally, many spots along the wild and rugged coastline of the North Pacific offer excellent whale watching. Whales are among the most magnificent animals in the world, and a highlight of any trip to the north Pacific coastline. You miss Seattle, Ballard and Larsens Bakery…. Larsen’s is just a 5 minute walk from Treat House Vacation Rental and a wonderful place to visit. Snoqualmie Falls is one of Washington state’s most popular scenic attractions. More than 1.5 million visitors come to the Falls every year. At the Falls, you will find a two-acre park, observation deck, gift shop, and the famous 270 foot waterfall. Located about an hour’s drive from Treat House Vacation Rental. Click on the photo above to go to our VRBO.Com Vacation Rental which is located in Seattle's neighborhood of BALLARD.